It's a typically we, weary and dreary night in Manchester so to raise our spirits who better than Starsailor. Back with a new album "Silence Is Easy", featuring 2 tracks produced by the legendary Phil Spector, the band have blown away any lingering memories of their humble new acoustic beginnings by cranking up the volume yet still producing top notch tunes drenched in emotion. 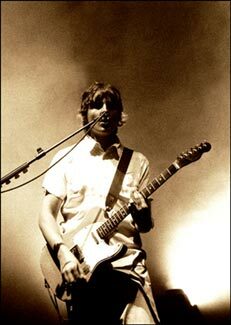 Joining Starsailor on stage is the Charlatans guitarist Mark Collins. 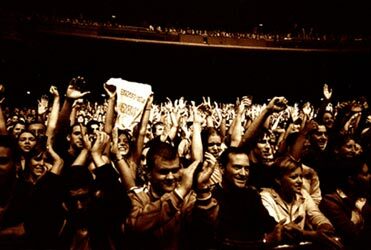 Opening the show is a album track "Music Was Saved" which is a subtle indication on how well the band have progressed and matured. James Walsh has really come into his own as a self assured, confident and affable frontman. Whether reminiscing about their struggling early days, failing to get gigs or encouraging the crowd to sing along, the quietly spoken singer seems genuinely comfortable and relaxed on stage. Perhaps this is down to the fact that becoming a father has grounded him. The mesmerizing "Alcoholic" follows and although obviously familiar it still sounds fresh and gracious with Walsh's vocals towering over the piano intro. Even "Poor Misguided Fool" has a sense of much need urgency by the livelier and rockier interpretations the band offer. "Fidelity" is a real uptempo blast of hedonism which takes James into an unexpected rendition of U2's "Where The Streets Have No Name". Strumming his acoustic like his life depends on it and taking those Bono comparisons to their logical conclusion. "Love Is Here", stripped back and beautiful, still sounds as heart-warming as it did the first time I heard it. In an attempt to emulate the anthemic classic indie disco hits such as the Roses' "I Am The Resurrection" Starsailor recorded "Four To The Floor" and performed tonight like a band reborn. Returning for an encore following the bands recent single "Silence Is Easy" the band launch into their most famous song "Good Souls". A spaced out and dramatic reworking which has more in common with the remix rather than the album version, but what a finish. While the new songs will take a while to get used to, it shows Starsailor as a band to be reckoned with. As a live attraction the band deliver the goods every time.